What was once a room with bare walls, old furniture, and a veritable dumping grounds of stuff that wouldn't fit anywhere else in the house has now become a lovely nursery for Hannah. Joni has such wonderful design tastes, and the nursery is a shining example of her skills. Since words are worthless compared to pictures, I'll leave you with pictures of Hannah's room. The title of this post came straight from the mouth of Joni's doctor. Our final sonogram shows Hannah is already 8 lbs, and Joni is only 36 weeks and a few days. Big babies run in her family, and we weren't really surprised. We do have a picture posted here, but Hannah was not in a photogenic mood, so this is the only shot we got. If you click the picture, you'll see why we saved it. 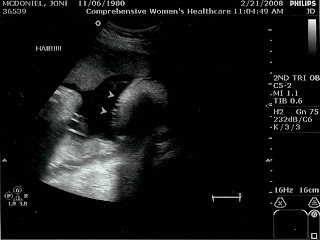 The sonogram also revealed that while Hannah is big, she also has a head full of hair. Isn't technology amazing? We go back to the doctor next Thursday, and I'll let you know if anything develops. You asked for a belly shot, you get a belly shot. This was the only picture for which I could get "consent" from the mom-to-be. This was at her baby shower and she is glowing as you can tell. 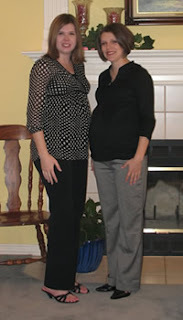 Christa (on the right) just had her baby, and Joni is only a few weeks behind. We have another sonogram next week, and then we start the weekly trips to the doctor. Someone asked me recently if I was ready...my response was that I didn't really have any options as this point. :) I'm so ready to see my baby girl!!! I leave this weekend for Winterfest in Gatlinburg, and am excited to be speaking again with Jeff Walling. Joni will not be alone, and she has been instructed by various family members to take it easy while I'm gone. We're still far enough out from the due date that we're not really worried. Our travel business, Off to Neverland Travel, is moving along and finally getting some bookings. Be sure to check out the new site and let us know what you think. Also, if anyone is looking to make some side money, we would love for you to Join Our Team.